At the time of the first edition of the Ordnance Survey large scale map of Hampton (1863-64) almost all the shops and businesses in Hampton were located in either Thames Street or High Street. By the second edition (1894-96) a number of shops had sprung up in Station Road and a couple on Priory Road. The third edition (1914-15) reveals much further growth in Hampton, particularly of shops in Station Road, Milton Road and also Priory Road. The fourth edition (1934) shows the shops in Ashley Road, Station Approach and Wensleydale Road had also been constructed by that time. In the nineteenth century Thames Street was the main shopping street but the coming of the motor car, in particular, as well as development to the north and west of the parish led to the build up of shops in Station Road and other areas and ultimately to the decline of Thames Street as a shopping street. High Street was the other old through roadway and contained many long-standing businesses at one time. No. 1 High Street, now occupied by Geoff Howe (Marketing) occupies the former premises of the Red Lion. The pub closed in 1979 and had been rebuilt in 1908, but the old Red Lion dated back, probably, to Tudor times. The Jolly Coopers at no. 16 still occupies premises that have housed it for nearly three centuries. 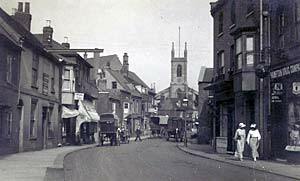 There were still a great many shops in the High Street until around 1980. Station Road (formerly New Street) came into its own, as a shopping street, following the arrival of the railway in 1864. Even 25 years ago it housed a co-op, toy shop, television shop and numerous other small shops. Fortunately Shaun’s Quality Meats at no. 121 continues the butchers business that has been run on the premises (formerly Bewsey’s) for many decades. Priory Road has some very long running businesses. 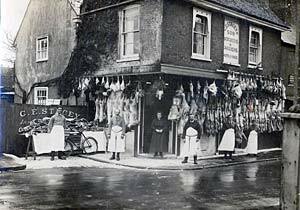 Grimditch the butchers is still in business today, as it was seventy years and more ago. 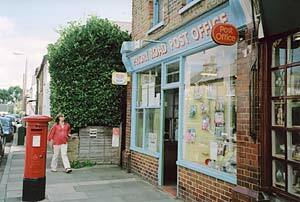 The Priory Road Post Office ceased to be a Post Office in 2004, but was already a stationery shop in 1901 when the Post Office was added to the existing business. Moss the chemists at no. 28 has been used as a chemist since at least the 1930s. The shops in Ashley Road, Milton Road, Station Approach and Wensleydale Road gradually built up over a number of decades. The Milton Road shops are the oldest dating from the 1880s to 1905. The other roads did not exist until 1894 and the shops in them were built between 1915 and 1934. It is interesting to note that no.’s 1, 2 & 3 Station Approach, now occupied by Threshers Wine Shop, The Cavan Bakery and Moss the Chemist were, as long ago as 1931 occupied by businesses in exactly the same trades. and be used for “office-type” non-retail functions or be converted to housing. With the arrival of what is now known as the “little” Sainsbury’s in the early 1980s on the Nurserylands estate, followed by the opening of the “big” Sainsbury’s in 1990 on the old St Clare’s nursery site the age of the supermarket in Hampton had begun. More and more shopping is now done at supermarkets, superstores and other larger-scale businesses. On the other side of the coin, the St John’s “convenience” store in Station Road had expanded and, perhaps, shows that certain “local” stores will survive, particularly with increasing congestion on the roads. Probably other speciality shops may continue to hold their places on local streets as well.